My quilt guild’s year-long challenge to get things done is working. I finished the project due next month. It’s a small quilt, but it was on a large stack of projects so making any kind of a dent in that pile is a victory. In the interest of full disclosure, I will probably add more beads to the quilt at a later date, but for now I’m satisfied with this one embellishment. While I was inspired, I made a few more small quilts. This one is called Equilibrium, in honor of spring, which is today. I also finished one of the blocks from the Peggy Martin workshop for the Display Block Committee of Amador Valley Quilters. The guild has a collection of 16-inch blocks that we can show at schools, libraries, or other events. Seeing all the progress in my sewing room made me take another look at the stacks by my computer. I have almost as many writing projects as I do quilting projects. 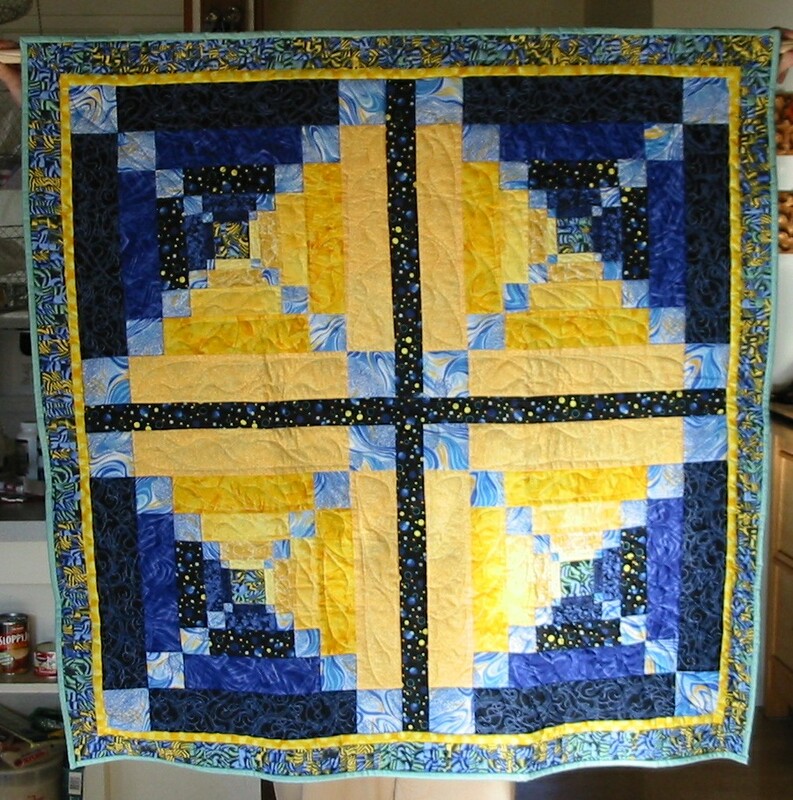 As with my quilting, I envisioned creating a body of work that I could submit for contests. That didn’t happen. As with quilting, when those Call For Entry emails arrive they are usually accompanied by guidelines. I’ve tried writing artist statements that would convince a panel the quilt I had really does fit the contest, but those statements rarely made sense even to me so I knew a judge wouldn’t buy it. There’s even less wiggle room with writing contests. That’s why I’m going to start posting twice a week now–once for quilting, once for writing. Wednesdays will still be quilting day. I’m not sure which day will be writing day, but I’m leaning toward Monday. Now that I’ve put my intentions out to the universe, I have to be accountable. I’m putting myself on the journey to finishing what I start in all aspects of my life. The jeweled spider is an important character, as suggested by Julaina Kleist-Corwin, so it has a prominent position on the tray. I made the ceramic crow and the purple snowflake ornament, but the other pieces are things I found in odd drawers and corners. My sister tossed her perfect auburn curls. “But you will be making art. It will cover Angelica instead of hanging on a wall, but it will still be art. I’ll make sure Angelica knows how lucky she is to be related to a famous fiber artist.” She flashed the million-dollar smile I paid for after the car accident, with me at the wheel and her side smashed into a tree. Every cut I made into that batik felt as if I were slicing into my own heart. Never say no to family, that’s the motto pounded into our heads. I made the quilt with care, but not with love. I finished the center and realized there was still enough of the batik left for my project if I used something else for the borders of the baby quilt. I searched through my stash for a suitable substitute. A golden leaf print blended well with the other fabrics, as did an aquamarine solid, but both seemed more like afterthoughts than integral parts of the design. While I never apologize for my decisions, I knew my sister would nag me about those fabrics so put them back in the drawer. I stifled the impulse to throw my phone across the room. The talismans my sister had given me at the summer solstice – a ceramic crow, a jeweled spider and other bric-a-brac on a tray – caught my eye. She said it was an altar of protection, and that I desperately needed it. I snatched the jeweled spider and broke one of its legs. The wire pierced my skin. A drop of blood welled on my finger. As I watched it grow, the blood turned from dull red to a glowing red-orange, like lava. Sparks of light rose along the edges, as if they were bubbles in water about to boil. The sparks flashed diamond-white. The spider wriggled from my grasp and crawled up my arm. My skin opened everywhere the raw wire touched, bringing pain and heat. I heard a crackling sound, and the spark bubbles exploded from the blood drop. They scattered about the room. Smoke puffed from each spark. I smelled burning cotton and silk, and the toxic odor of melting plastic. The spider waved its wire stump at me. “Apologize.” It spoke with a crystalline voice – sharp, high, unyielding. I tried to sweep the spider from my arm, but the beveled edges of the jewels sliced my hand as if it were so much sandwich meat. My knees buckled. Stacks of fabric tumbled to the floor with me. The air swirled with each avalanche, fanning the tiny sparks into flames. I watched the flames jump from fabric to bookshelf to curtains. The smoke smelled angry. It smelled of my own hate. Now I must choose how I will end, in bitterness or rage. This wasn’t going to be my most productive week in the sewing room. I pulled out boxes of fabric and knew they would take more time to organize than I had. Deadlines for other projects sat on the calendar, glaring at me. My to-do list ran to three pages. You’re waiting for the punchline, I know you are. There isn’t one. There is, however, good news to share which has nothing to do with my sewing room. My friend Ann Anastasio is co-producing a quilt retreat next May. It is called Art Quilt Santa Fe, and will be held at the Buffalo Thunder Resort & Casino (near Santa Fe, New Mexico), May 1-6, 2011. The featured teachers will be Michelle Jackson and Linda Schmidt. Ann Anastasio was my first quilt teacher, my first friend when I moved across country for my husband’s job, and still a good friend even though she moved half-way across the country for her husband’s job. Organizing a quilt retreat has been a dream of hers for years, and I couldn’t be happier that she and another friend have finally achieved their goal. 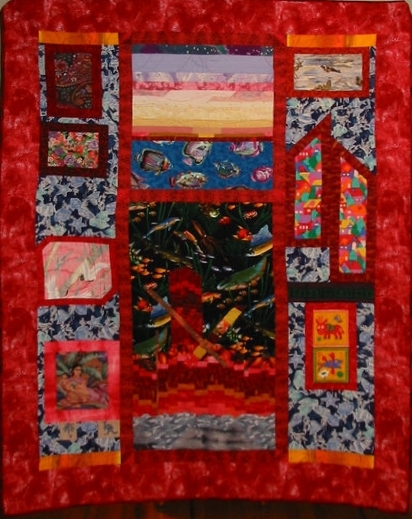 The website for the retreat is http://www.artquiltsantafe.com. There are links to the teachers’ websites, as well as to Broken Dishes Repertory Theatre (www.brokendishesrepertorytheatre.com), which will be performing at a gala banquet during the retreat. Broken Dishes is Ann and me. Broken Dishes was my dream come true. When I’m not quiltiing I write stories, and I had always wanted to perform as well. Ann suggested we entertain at guilds, and with another quilter friend, Evelyn Judson, we started singing, dancing and telling stories about quilts. Evelyn then moved (also for her husband’s job), but Ann and I kept performing. So, my cleaning schedule got derailed, but life is still good. Next week, I hope to make more progress in the sewing room. 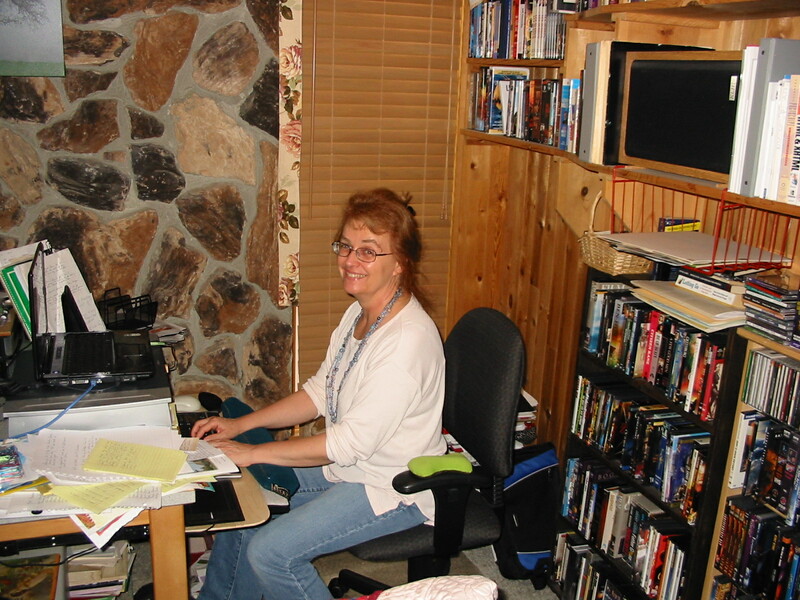 Who knows, someday I might even get that room organized – then I can start on my writing area.